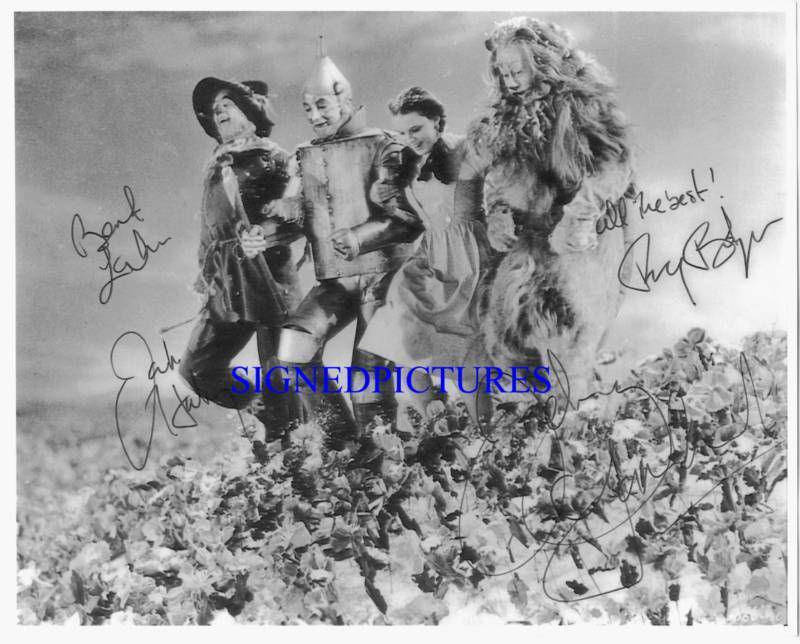 SquareTrade AP6.0 THE WIZARD OF OZ CAST (Autographs of all are preprinted within this classic print) "JUDY GARLAND, BURT LAHR, RAY BOLGER AND JACK HALEY" AUTOGRAPHED 8x10 THE BEST AND MOST AMAZING AUTOGRAPHED CELEBRITY REPRINTS YOU WILL FIND Excellent 8x10 autographed photo by THE WIZARD OF OZ CAST. Autographs of all are Preprinted within the excellent glossy 8x10 and is shipped very secure with a clear firm plastic photo protector and includes a certificate and guarantee. Offered for entertainment value. Winning bidder has choice for shipping and handling. Within the USA 2.99 for regular 1st class mail, 7.00 for Priority or for Express Mail see current usps rates, add .75 cents for each additional item. For International/Overseas, Airmail shipping/post is US 7.00 add 3.00 for each additional item. Please view my other items. Click Here to see my other items Payments must be received within 10 days. Pay me securely with any major credit card through PayPal! **FULL REFUND UPON RETURN IF YOU ARE NOT SATISFIED **INCLUDES A CLEAR PHOTO PROTECTOR, GREAT TO DISPLAY **THANKS AND ENJOY ** If Purchasing Multiple Items, Select ADD TO CART to combine shipping Powered by Turbo Lister The free listing tool. List your items fast and easy and manage your active items.